Whether you love tattoos or hate them, the British clearly have something of a penchant for engraving their bodies with inky art. There are a staggering 2,228 tattoo parlours in the UK. Compare this with 2,034 Costa coffee shops or 898 Starbucks, and you begin to understand why tattoo studios have been heralded as helping to save the British high street. Among the many designs and styles available, Japanese tattoos are particularly popular in the UK. This has created a niche industry – British-based companies have Japanese speakers translating messages into Japanese for new tattoos and there are Japanese calligraphers based in Britain designing new tattoos specifically with UK ink lovers in mind. But while this infatuation with Japanese ink may appear to be a modern phenomenon, it is in fact continuing a British tradition that dates back many years ago. To explain, let’s briefly go back to London in 1881. Sutherland MacDonald has not yet opened London’s first tattoo parlour. So, what do you do if you are a 16-year-old who wants your first tattoo? Well, if you are the Duke of York (the future King George V) you go to Japan and get a famous Japanese tattoo artist – Hori Chiyo – to ink you. King George V acquiring his first tattoo from the Japanese tattooist Hori Chiyo. And, since you are the future king, you become something of a celebrity among wealthy upper-class Britons – and getting inked by Japanese tattoo artists becomes the thing for them to do too. This love of Japanese tattoos lives on to this day. You can now find British tattoo artists specialising in Japanese-style tattoos in almost every city in Britain. 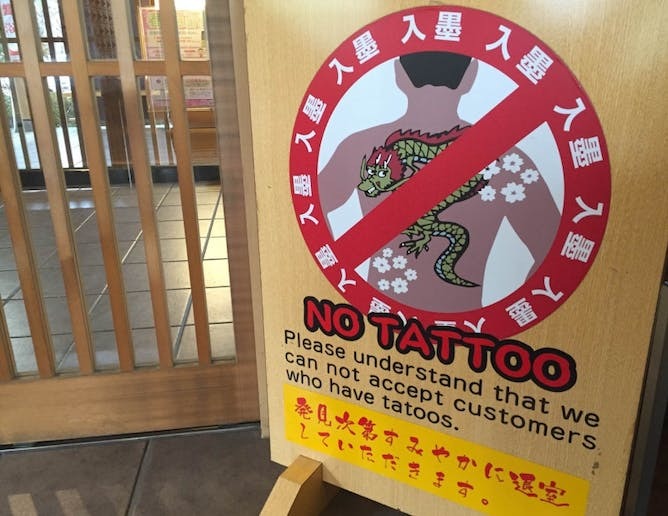 So it seems a little ironic that tattoos are still largely taboo in Japan – many gyms and swimming pools ban people who have been inked. Even celebrities are not exempt – Ryan Tedder, from the pop band OneRepublic, had to cover up his tattoos in the gym when the group recently toured Japan. There is even a Japanese website that lists recreational facilities, including hot springs, swimming pools and gyms, that allow tattooed members and won’t make them cover up their tattoos. The general stigmatisation of tattooed bodies in Japan is largely down to both historic gangster associations and expectations of social conformity. The Japanese have a phrase 出る釘は打たれる which literally translates as: the nail that sticks out gets hammered down. And this hammering down seems to be happening all over Japan. In March 2015, the Straight-Life Osaka Tattoo Convention was cancelled without reason a few days before its opening. Perhaps coincidentally, the anti-tattoo politician Tōru Hashimoto was mayor of Osaka at this time. 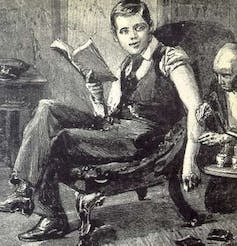 Then in August 2015, tattoo artists at Chopstick Tattoo in Osaka were arrested and fined for using a needle to pierce skin without a doctor’s license – which was said to be against the Medical Practitioners Act. Three months later in November 2015, tattoo artists at 8BALL Tattoo Studio in Nagoya were similarly arrested and fined. It isn’t only tattoo artists who are at risk – in June 2016, an unnamed nursing student at a higher education institute in Tokyo was suspended for a year when it was discovered that she had tattoos. If the police’s interpretation of the law stands, it will spell the end of tattoo artists in Japan. This isn’t only about the freedom to be a tattoo artist. This is a fight for freedom itself. Tattoo artist Taiki Masuda from the campaign group is currently in court in Osaka disputing both his fine and current interpretation of the Medical Practitioners Act. Meanwhile the unnamed nursing student is in court in Tokyo suing the higher education institute because the conditions of entry did not include not having a tattoo. Whatever Japan’s relationship towards tattoos, it’s clear that in the UK, they are here to stay. According to YouGov, around 19% of Brits have been inked and most – 86% to be exact – don’t regret it. In my hometown of Glasgow, as many as 40% of the population have six or more tattoos. This might sound like a lot, but Glasgow is in fact only the third most tattooed city in the UK – after Birmingham and then Norwich. And were King George V alive, I’m sure he, like the many tattooed people in the UK today, would give Japanese tattoos his royal seal of approval. Previous Post Recreating the spirit of a Mariah-Carey-like Diva in a unique performance of Handel’s Messiah Next Post Memory ability in criminal investigations: Could you help?